Imagine a kind spiritual director you trust and respect looking you in the eye and gently inquiring, “How is it with your soul?” How would you answer that question today? I am saying “soul” meaning the part of you that is most real. Soul is the true you, the part of you God made you to be. Your soul is the part that connects with God. Or dodges him. We’re not talking about your spiritual activity or practices or posturing. The soul is your naked self. I have found my soul in all kinds of conditions at various times. Sometimes my soul is cluttered and distracted. Other times I would describe it as buried, layered over by activity and busyness. Can you relate? Have you experienced a soul that felt hardened? Or sometimes a soul that seems fully at rest, or connected to Jesus, or peaceful, or bursting with joy? How is with your soul these days? Often we aren’t even sure at first. That’s a sure sign we need deep fellowship with Jesus. Summer is a good time to do some soul work. Today in staff meeting I reminded our team about the occupational hazards of working at a church. Many in ministry live unbalanced lives which teeter on exhaustion and fatigue. I’m not saying we’re the only ones, just that we’re not immune. A few years back I realized that the staff was nearly always tired and worn out. It didn’t take long to realize they had a pretty good example of how to live like that. Me. My own pace, hard-charging style, driven schedule and overwork authorized imbalance as okay. It all led to a humbling examination of my life – my schedule, pace, and hardest of all, my motives. That led us to come up with a “policy” to help all of us say out loud, “We don’t want to be a place that rewards unhealthy, unbiblical, unbalanced living.” It is intended to build in some safeguards for ourselves that will protect Mountain and our staff team from the deadly patterns that are so common to people in ministry. It has led us to a better place, a way of doing ministry that celebrates rest and health and family as much as it does “getting the work done.” It has opened the door for God to do soul work not just THROUGH us but IN us as well. As we revisited the “REST POLICY” today it occurred to me how much this same “policy” could bless everyone. We all live in a culture of overwork. A culture where our soul hides or hurts for long periods of time. 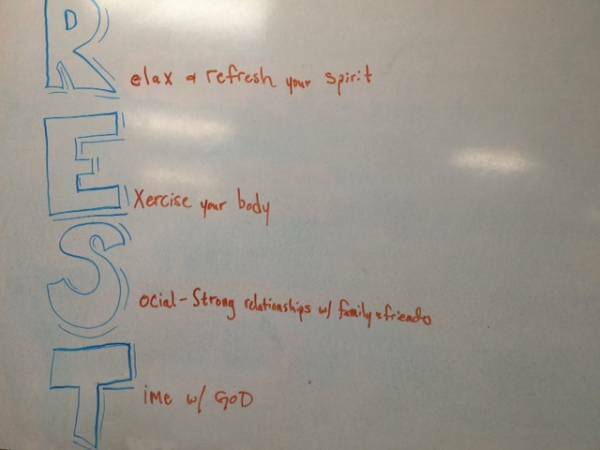 Here is a picture of the whiteboard acrostic I drew. It’s really not a policy. It’s a life-giving guide to help keep your buckets filled. It’s a way to keep your soul alive, thriving, and at rest. Look it over. Think about it. In future posts I’ll unpack it a bit more. For now, be real enough to answer the question: would some of these invitations help my soul find rest in God?